In Feb-12, I got a chance to volunteer for Columbia University Digital Science Center NYC. Build a document that can help students at the Columbia University choose the right reference management software. The Digital Science Center of Columbia University incorporates state-of-the-art technology, high-end software and research data sets for scientific analysis and visualization, and professional, discipline-specific consulting and support from undergrads to Research scholars. My internship was focused on the Competitive analysis of reference management of various software for the library users (mainly students and research fellows) and resulted in the production of educational materials pertaining to the software and hardware available in the Digital Science Center. I created a one page artifact for quick selection of the most suitable software as per the user specific requirements. 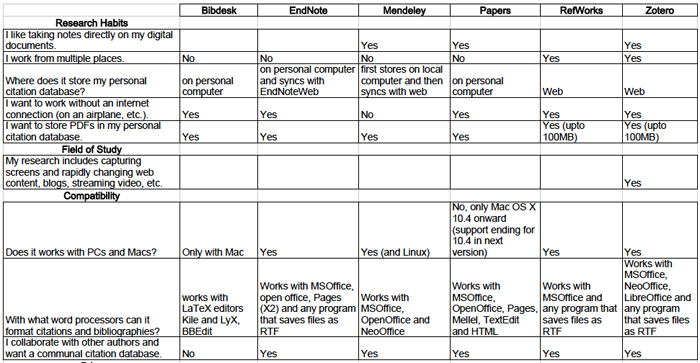 For somebody who wants more details about any of those software, I created a detailed table of various features available in the software current versions. My comparison was mainly focused on research habits of the students, their field of study, compatibility of the software and price of the software. Learned about how documents are developed to educate the users about the softwares. Specifically focusing on their requirements can speed-up the learning of a software and saves user from having a dillema about what to choose when so many options are available that "claims" to meet all their needs.